Located on the edge of the Southern Ocean, this 3000-acre property offers some of the best budget camping in South Australia. Roll out your swag in one of our purpose-built swag huts, or choose a spot amongst the gum trees to park and set up camp, or pitch your tent. It’s pretty comfy for a bush camp. Sites aren’t powered but there are toilet facilities (BYO TP), solar hot showers, and a fully equipped camp kitchen. The camp site area is large so you’ll have plenty of privacy. And there’s lots of space for your four-legged friend. 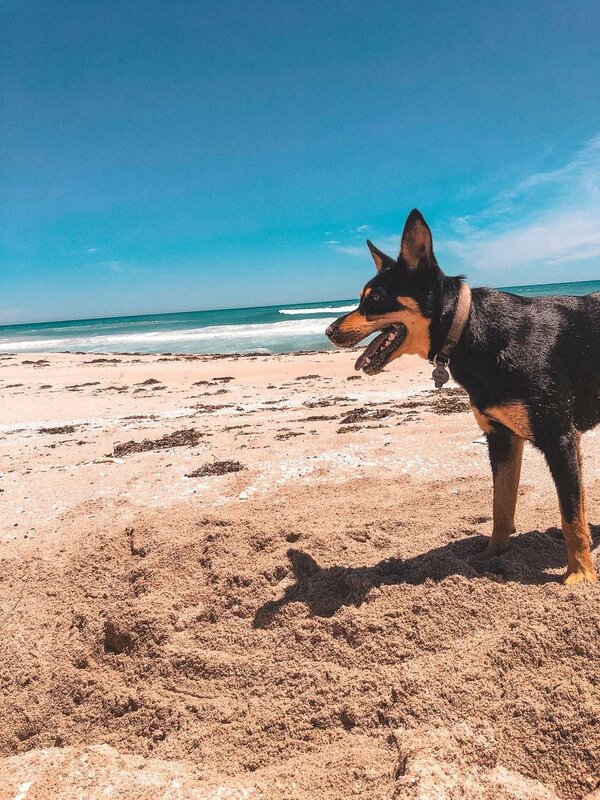 When you’re ready for an adventure, you can take your dog to our private beach. It’s a short drive from the camping ground in a 4WD, or a nice long W-A-L-K. Watch the sunset with your best mate and then head back to the camp kitchen and share stories around the campfire (unless it’s fire ban season, in which case the stars will provide the glow). As a 100% carbon-neutral and fully certified eco-friendly property, we believe in respecting the land and all the animals that live here. Naturally, we ask that your dog is on best behaviour and that you supervise them at all times. Camp Coodlie at Coodlie Park Farm Retreat is one of the best places to stay when you’re crossing the Nullarbor, especially if you’re travelling with your dog. At $15 per car, it’s friendly to your wallet, too – and yep, that price includes your caravan or trailer. There are no allocated sites. Just check in at the Homestead on arrival and then choose your preferred spot in the camping grounds! Maggie on the private beach at Coodlie Park. Photo by Marjolein. Not a camper? No worries! Coodlie Park also has budget dorm-style rooms / backpacker accommodation, and self-contained cabins available. Book directly with us for the best deals. Pet conditions: Dogs are permitted to be off lead but must be kept under control and near you at all times. Price per night: $15 per vehicle, per night. Pets are free. Distance from Adelaide: Approx. 7 hrs. Distance from Port Augusta: Approx. 4 hrs. Distance from Port Lincoln: Approx. 2.5 hrs.